All students will need to own drop type test kits and/or meters for testing Ammonia, pH, Nitrite, Nitrate, KH, and Salinity. Water Quality is probably the single, most important aspect to grasp in order to become a keeper of healthy and prospering Koi. The purpose of this course is to instruct the student on how to acquire quality water, how to perform proper testing, how to understand test results, and how to properly react to test results. Learning about water quality and water clarity aren’t the same. Crystal clear water can contain compounds that are deadly to your fish. This course taught me so much about the science of koi keeping; something I had always wanted to understand better. It was difficult, long, and sometimes had twists that enticed me to think creatively. The clue of (Boo) was very cute now that I understand it... Well done. Awesome course. I thought I knew a lot about water quality but still had problems with some areas. Lots of information! Great course! As a long time amateur Koi keeper I had gotten lazy and was dependent on experience and luck. Syd helped me through some of the more complicated materials. I am now keeping a journal and feel much more poised to go forward. Lots of math, but I guess that is expected in pond since there is a lot of calculations needed to ensure you are adding the appropriate medicines and chemicals to pond. So it took me longer in this module as I am not a math wizard, but writer does help you along. This course really made me think and helped me learn a lot. I also had to do some research to come up with some of the answers on the test. It helped me learn even more, and I ran across even more information that wasn't on the test. The math portion was tough for me, but not impossible. Now that I get it, I find myself testing my understanding by coming up with scenarios and trying out the math formulas to check my results. I highly recommend this course to anyone with a pond. Water quality is the key to success. Hi Syd, I am impressed by your expertise and the amount of time you spend customizing your answers to your students. Your last comments were very interesting, I save them preciously in my archives and will share them during a future presentation to the San Francisco Bay Area Koi Club if it's OK with you. Thanks a lot! 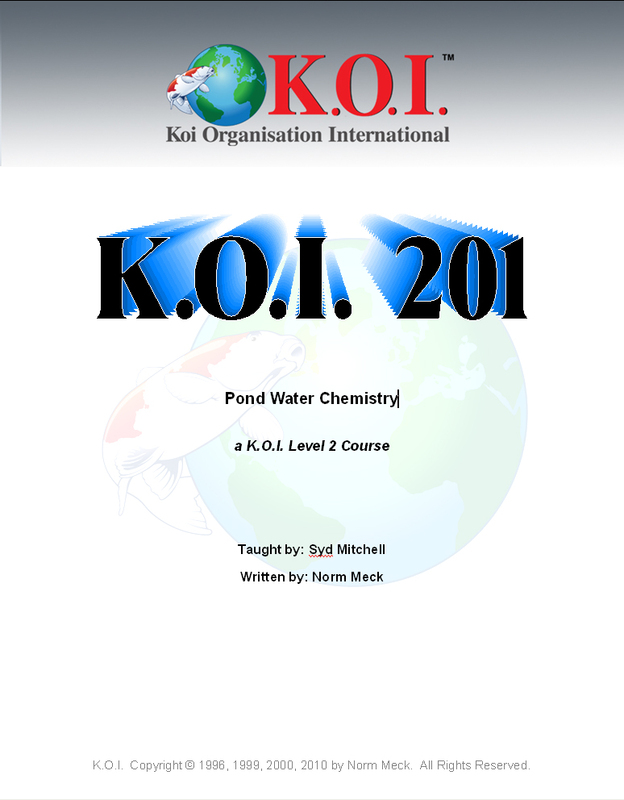 This was an intensive course that was well worth the time, you can not rush through this section as water quality is key to having a healthy pond for the koi. There is a lot of math involved so you may have to review several times before getting it right, but the instructor is helpful and quick to respond. The course text is an Adobe Acrobat document entitled Water Quality by Norm Meck. There will be additional reading assignments for the course. A written test will be given at the end of the course via email. Please contact the instructor by email when you are ready for the test. Students will be given every reasonable opportunity to understand the answers to the exam questions. Students will be prompted for a more complete answer if their first attempt is insufficient. There is no particular passing grade to complete this course but the instructor will work with the student until they both agree that the student is ready to continue.